Acceleration is equal to force divided by mass. The larger rock is harder to pull because the mass is much larger than the smaller rock which means that it would require more force then the smaller rock. 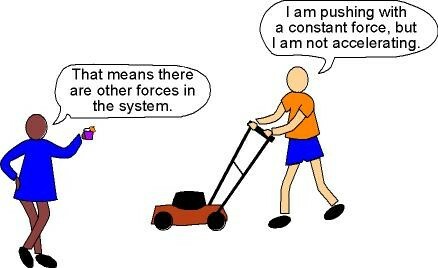 The lawn mower is about the same size as the man thats pushing it so the object is easier to accelerate. The mass of the bus is large which makes it harder for the object accelerate. The second law of motion has to do with acceleration. This law is applied to my life in so many different ways. The first example is if I was pulling the trash can to the curve and it wasn't larger than me then it would take more force to accelerate the object. If my car broke down in the middle of the road and I had to move it out of the way then I would need more people so that the force would be large enough for the car to accelerate into the grass. If I was going bowling, and I picked up a 10 pound ball it would accelerate slower than if I rolled a 5 pound ball because the force would be the same but the 10 pound ball would have more mass.